Because putting up with Windows 8 wasn't enough of an achievement in itself, Microsoft has baked Xbox-style achievements into Windows 10. As noted by Neowin, the latest build of Windows (10056) gives you a virtual back clap for undertaking certain tasks by displaying an on-screen notification message in the bottom-right hand corner. Because well done you. 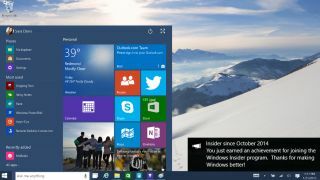 Opening the Windows Insider program hub, which keeps Windows 10 preview users up to date, has been uncovered as one of the first achievements. Our lives are waiting to be changed, guys.